Swords of the Emperor combines the two Warhammer fantasy novels Swords of Vengeance and Sword of Justice along with the short stories Feast of Horrors and Duty and Honour. Each of these tales have been brought to life from the pen of Chris Wraight who creates a sense of maturity and depth to the Warhammer series. The story follows the hero's of the Imperial Army as a Rebellion consumes Averland, threatening to turn into civil war while Orcs press forward from their mountain lair. Suspecting that the taint of Chaos is behind the many problems, Emperor Karl Franz sends two of his most trusted Champions to defeat Orc and Chaos alike while restoring order to the land. What follows is a tale that defines the term "epic" with pitched battles, political infighting, the insidious touch of chaos and good old fashioned greed. Heroes are born and others killed while some that deserve death still live. I must admit I'd never even heard of Chris Wraight until this book landed on my doorstep and I now kind of wish I'd paid more attention. He has a very confident, mature voice which adds an extra dimension to the Warhammer story. So much so that out of any Warhammer Fantasy story, this book should appeal to the broader audience, fans of fantasy who have never even heard of Warhammer, Games Workshop or indeed the Black Library. Warhammer fantasy often feels like the poorer cousin next to the might of 40k, what with the talented authors Abnett, Dembski-Bowden, McNeill and Thorpe all lending their voice. As such it's great to see Black Library pushing for more exposure of this sub-genre and it feels like Wraight is really leading the way. This journey into the olde-world is simply magical, the authors descriptive prose lends itself perfectly to the many action scenes, from small fights and skirmishes all the way up to large battles - each are handled with aplomb. The characters that populate these stories really do make the book stand out, each with their own foibles and agenda - adding a great deal more grey to what is often seen as a black and white good vs evil world. At the same time Wraight does manage to capture the tone of the Warhammer fantasy world pefectly, there isn't a moment that you don't think this is pure Warhammer. 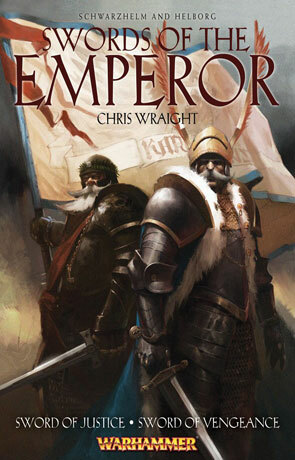 Swords of the Emperor is an excellent Omnibus, with a great cast and even better storyline, this is one book that should appeal to any fan of high fantasy, Warhammer fan or not. Written on 29th October 2012 by Ant.